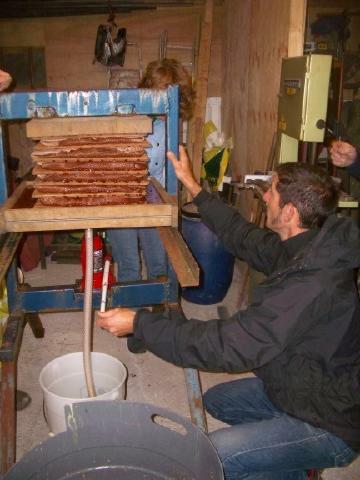 Cider/juicing for beginners event Sunday 10th Nov here at Killibury. We ran this last year and covered types of apples, basic cider making, juicing and had a practical huicing session in the afternoon. im hoping we can run a juicing event in the dormouse orchard this year ,some of the other old orchards of york have done such things and they seem very popular. as well as getting the dormouse sorted i am involved with setting up a all inclusive ancient orchard group that will get as many as possible sites working together to swap info,clones,supporters etc etc and to provide a "one stop"point of contact for publicity ,funding and practical advice and support and to provide a nursery for genetic preservation. Im a bit unsure why this has popped up - checking this morning there was a strange post 'reply' to the original post (back in 2007). Ive cut my teaching right back now- am only really teaching apple based events, and John is still teaching blacksmithing.